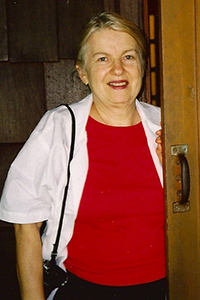 Lisa Locken joined the Friends Board of Directors in May 1999 and served on the board until her death on Feb. 10, 2007 at age 70. She was born in Fargo North Dakota to John and Althea Duckstad. Her high school years were spent in Ironwood Michigan, graduating there from Luther Wright High School, and then attending the University of Minnesota where she earned a degree in art. Eventually she married John Locken. Before joining the Friends board she had recently retired as Director of Communications for the Bemis Company in Minneapolis, a large international packaging company. She was also on the board of directors of the Oscher Lifelong Learning Center at the University of Minnesota. Lisa doing what she did well. Lisa Locken at the Martha Crone Shelter. Under her editorship, the newsletters consistently had eight pages, always incorporating a “President’s Letter”, and frequent articles from the Gardener to keep the membership abreast of what was happening in the Garden. Just before Lisa became editor a switch in printers was made so that photographs could be routinely printed in the newsletter and Lisa made much use of that capability. She began a column called “Meet the Volunteers” - brief articles on the people that volunteered at the Garden, always incorporating what drew them to the Wildflower Garden or what they liked about their job. Lisa did all the editing, proofing and mailing supervision herself. In the Summer of 2000 she rescued and brought to the Garden some Fringed Gentians from a disturbed area near Detroit Lakes. The flower is the namesake of the newsletter. The Locken memorial tree is the large oak in the center of the photo. Friends President Steve Pundt wrote that “Lisa was talented, generous, loyal to the Garden and the Friends, and enthusiastic in everything she did. The Friends were given a gift when Lisa asked to become the editor of The Fringed Gentian™. She is greatly missed. 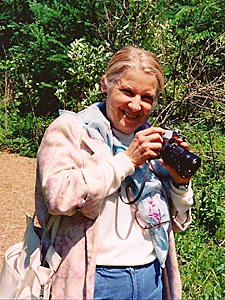 Many of the Friends attended her memorial service on March 10, 2007. Many memorials were received by the Friends in her memory and a special group of her friends in an investment club donated funds of a memorial tree in the Wildflower Garden. 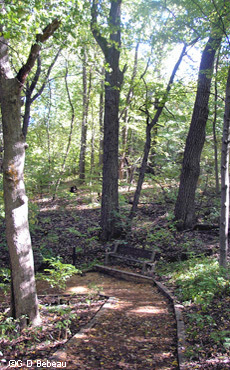 That tree is a large oak on the path leading down to the Garden Shelter. Reference: Minutes of The Board of Directors and other documents of the Friends of the Wild Flower Garden, Inc.; Text by Gary Bebeau.